An unexpected yet familiar guest arrives on Joe West's doorstep just in time for Jenna Marie West's homecoming - Barry and Iris's daughter from the future, Nora West-Allen! Going by the superhero name XS, Nora has been trapped in the past and spying on Team Flash while trying to figure out how to ebst approach them for several months. Of course Barry is quick to want to get rid of the young woman before she causes a paradox and changes his present or her future, but he still can't help but wonder about what happens to him in the years to come. And with a new metahuman menace threatening Central City, he may need another speedster's help. The CGI of Nora running during the opening narration is way below the series' usual standard. So is the CGI of Nora and Barry running together in the second segment. Jessica Parker Kennedy proves an engaging presence as XS. It would be easy for her character to become vexing quickly, but she manages to find the right balance between exuberance and annoyance. Apparently all of the episode's budget was blown on the sequence in which three speedsters are Vibed onto a plane. THAT scene looks fantastic. The character of Nora West-Allen is unique to the universe of The Flash TV series. However, she is made up of several elements of characters taken from the comics. Nora West II - a future speedster and daughter of Barry Allen, who goes by the code-name Cruise. Cruise was first introduced in Justice League #26 (Vol. 3) (October 2017). Physically, she resembles the New 52 version of Iris West - a Caucasian woman with auburn hair. Like Nora West-Allen, she was named after Barry Allen's mother, Nora. In the comics, XS is the code name of Jenni Ognats - Barry Allen's granddaughter and first cousin to Bart "Impulse' Allen. A speedster like her mother, Dawn Allen, and he grandfather, XS was a member of The Legion of Super Heroes in the 31st century. She first appeared in Legionnaires #0 in October 1994. 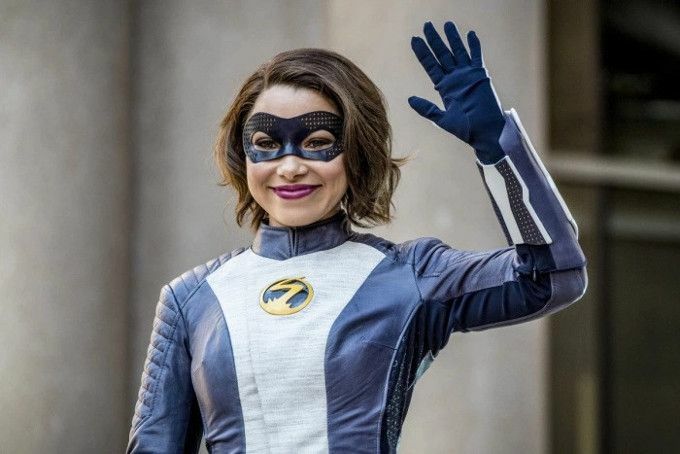 Nora West-Allen's costume utilizes the same chest symbol as XS in the comics, though her snaking s-shaped bolt of lightning with a flash at the end is confined to a small circular patch like The Flash symbol on Barry Allen's costume. The original comic design had the logo printed across the chest. The costume also uses a similar color scheme, being purple and white. Barry's and Nora's favorite dessert is said to be two scoops of cookie dough ice cream from the Mason Family Ice Cream Shop in Happy Harbor, Rhode Island. In the Silver Age Justice League comics, Happy Harbor, Rhode Island was the location of the cave The Justice League used as a base. Nora uses the word futuristic slang word "schway", which means "cool." The word "schway" was first used in the animated series Batman Beyond. Gridlock is the name of a villain who appeared in Impulse #7 in October 1995. Abner Girdler was an urban-planning specialist whose life was ruined after a county transportation commissioner suddenly killed the funding for the revolutionary monorail, which bankrupted his company. Girdler invented a technology that allowed him to stop the kinetic motion in anything for one hour and became the villain Gridlock to get revenge on the commissioner, who by that point was running for mayor of Manchester, Alabama. Gridlock is also the code name of Senator Hardgrave - a villain who appeared in Bat-Mite #2 (September 2015). The Arrowverse version of Gridlock is an entirely new character who has a different power-set. William Lang is a carjacker who has the power to absorb and redirect kinetic energy. The harder he is punched and the more he moves, the harder he punches back. In this respect he is similar to the X-Men villain Sebastian Shaw. Nora also uses the futuristic curse word "grife." This word has long been a standard of 30th century slang and is frequently used in the Legion of Super-Heroes comics. Nora mentions a Flash Museum and says it has a curator named Mr. Myles. The Flash Museum is a well known part of the lore of The Flash, having first appeared in The Flash #154 (August 1965) where it was created as a tribute to Central City's hero. The curator was a Shakespearean actor named Dexter Myles, who first appeared in The Flash #138 (August 1963). Myles, who was out of work, was given the job as a reward for having helped The Flash with stopping a bank robbery. When Ralph is describing his idea for a manyverse, he proposes a world where everyone on Team Flash is a bad guy. This is the basic idea for Earth Three in the DC Comics universe. Nora says that Barry's lighting symbol is way cooler than Lightning Lad's. This is a reference to a member of the Legion of Super Heroes who also had lighting bolt emblem on his costume. This suggests that some form of The Legion exists in the future 30 years from now or that XS encountered them when they came back to the past. Or that she went to the future. The newspaper article from 2049 which Nora shows Barry contains a number of nods to Crisis on Infinite Earths. In addition to the mention of red skies, and heroes from other realities (like Supergirl) joining forces with The Flash and his friends, the article also mentions The Psycho Pirate and says that Reverse Flash was seen leading an army of shadow demons. Nora says that Barry once phased an entire plane while fighting a villain called Mob Rule. First appearing in The Flash #1 (2011 series), Mob Rule was once a CIA Agent named Manuel Lago, who was a friend of Barry Allen's. Thanks to a CIA experiment, Lago developed the unlikely power to cut off his body parts and have each piece grow into a fully realized clone of himself. Nora gives Barry a ring from the future containing a costume designed by Ryan Choi. In the comics, Ryan Choi is the successor of Ray Palmer, who took up his role as a professor of physics at Ivy Town University and his mantle as The Atom. Ralph makes a joke about how Barry going back in time to stop The Thinker from killing him might have changed the timeline so that Ralph died during the STAR Labs particle accelerator explosion instead. This would actually explain away a plot hole from the first season, as Ralph's name was among those killed during the explosion that Thawne/Wells listed while confronting Blackout in 107. It's possible that one of Barry's trips to the past changed things so Ralph survived in the current timeline. The name of the ME on Caitlin's father's death certificate is Cameron Mahkent. In the comics, Cameron Mahkent was the secret identity of the villain Icicle Jr. - a supervillain with ice-control powers, who first appeared in Infinity Inc. #34. Cicada is based on a villain who first appeared in The Flash #170 (March 2001). Born David Hersch in 1890, Cicada was an architect and preacher who abused his wife Elizabeth. After killing her in a fit of rage, Hersch grew remorseful and attempted suicide. He was stuck by lightning in the middle of this and somehow acquired the power to drain the life force from other people, prolonging his own life for well over a century. The lightning also gave Cicada a vision of his wife's resurrection. He became convinced that The Flash was connected to him and formed the Cult of Cicada to begin sacrificing all those people whom The Flash had saved as a means of gathering the power to resurrect his wife. One of the fire marshal reports on Barry's desk says that crazing in the melted glass suggests a liquid accelerant. Barry says that any petroleum-based household product (i.e. floor wax, shag rugs or balloons) could cause crazing. The glass melts into the surface like ice cream into the cracks of a waffle cone. Caitlin Suggests using the Tachyon Absorption Enhancer Thawne used to boost Nora's powers so she can go back to the future. Negative tachyons slow a speedster down and prevent them from being able to time-travel. Wally says the Time Bureau has encountered them before, but nobody knows how they are generated or where they come from. Negative tachyons can also destroy any time drive they come into contact with. This means The Waverider can't be used to give Nora a ride home, as her body is saturated with negative tachyons. Cisco determines that the amount of Dark Matter in Gridlock's body increased as he moved and got punched by The Flash. This leads to the discovery that his power is absorbing and redirecting kinetic energy. Cisco is able to track Gridlock by hacking his phone. Cisco builds a Version 2.5 of his Tachyon Absorption Enhancer, which should overcome the influence of negative tachyons. Wally explains the Legends theory regarding changing the past. Certain events are soft and those things changing doesn't alter much else, like Gridlock being captured on the second try. Other events a hard and those being changed can alter everything, like Barry's saving his mother and creating the Flashpoint reality. Nora: My name is Nora West-Allen. The Fastest Woman Alive. Where I'm from? 30 years from now, I'm the guardian of Central City, just like my dad. People call me XS. Every day I hope to live up to the legacy of The Flash. But I've still got a long way to go. Cop: Going old-school today, Flash? The Flash: Yeah. It's a little tighter than I remember, though. Caitlin: What did you think we meant when we said Harry was from Earth-2? Ralph: That he is from Earth, also! Cisco: (incredulous) Negative tachyons? So, what? Instead of speeding you up, they slow you down? Cisco: Well, damn. I was just joking. That's a real thing? Nora: My name is Nora West-Allen and I' the Fastest Woman Alive. When I was a child, my father disappeared in something impossible. Then I grew up and became the impossible. Now I'm trying to live up to the legacy he created, so that one day I'll stop him from ever disappearing. I'm XS. How schway is that?! The episode continues on directly from the ending of 423. Nora West-Allen is from 30 years in the future - 2048. Nora confirms that she was named after Barry's mother. Nora knows everyone on Team Flash and in the West family. Nora says her code name - XS - came from a nickname Iris gave her when she was younger, saying she did everything to excess. Nora became stuck in past after helping her dad destroy the STAR Labs satellite. Nobody had told Ralph about the existence of Time Travel, multiple universes or The Legends until now. Cecile still has her telepathic powers and can read Baby Jenna's mind. Nora has elements of both Barry and Iris' DNA. Cisco confirms Nora has a connection to The Speed Force. Cisco mentions his break up with Gypsy from 420. He says he still hasn't had time to process it. Barry is officially reinstated as a CSI with the CCPD. Nora West-Allen is also a forensic scientist. She graduated from CCU with a 5.6 GPA. Barry's and Nora's favorite dessert is said to be two scoops of cookie dough ice cream from the Mason Family Ice Cream Shop in Happy Harbor, Rhode Island. Barry's parents took him there when he was a kid. In the original timeline, Gridlock was beaten after one battle. The curator of The Flash Museum, Mr. Myles, scrubbed all the supervillain's real names from the museum displays for legal reasons. It is unclear if this Mr. Myles is related (or an older version) of Dexter Myles, the curator of the Central City Museum in 104. Nora makes reference to knowing a hero named Lightning Lad in the future. Nora says that coffee in her time is $43 a cup. Nora seems anxious to stay around Barry and to avoid being with Iris alone. Nora recognizes the Tachyon Absorption Enhancer she uses as the one Barry used when he first met Supergirl in S118. Barry has to put on an old costume that smells bad. Nora recognizes it as the one he wore when he fought King Shark in 215. Nora lets it slip that, at one point, King Shark fights Gorilla Grodd. Without the STAR Labs satellite, Team Flash is without their usual eyes, ears, dark-matter scanner and facial recognition software. This means their ability to track metahumans is far more limited now. Ralph learns that Killer Frost has vanished and that Caitlin Snow apparently had ice powers before the particle accelerator explosion. Iris runs down the list of times Barry has time-traveled for impractical reasons. These include pulling Snart from before he died (322), going to the future to find out how to beat Savitar (319) and going back in time to 2015 to train with Thawne when he was still pretending to be Harry Wells (217). Barry guesses, based on Nora's behavior, that something happened to him in the future. Nora shows Barry the newspaper from April 25, 2049 - 25 years after the newspaper from April 25, 2014. It says that Barry never comes back after disappearing during a great crisis.. The newspaper article in 2049 is also written by Iris West-Allen. It mentions more heroes being involved in The Crisis, including Batwoman, Supergirl, The Atom, Elongated Man and Green Arrow. The article also makes reference to a villain called The Psycho Pirate, The Reverse Flash leading an army of shadow demons and Joe West being Chief of the CCPD. Nora says she was born a few years before the Crisis, but she has no memories of Barry. Nora says the first time she ever saw Barry was at his wedding to Iris in S308. Nora lied about being stuck in the past, using negative tachyons harvested from The Flash Museum archive to fake being unable to time travel. Nora says she's not responsible with her powers. Nora says she can't do most of the standard speedster tricks like phasing, though she can make time run backwards by moving a certain way. Barry teaches Nora how to phase, using the same advice Eobard Thawne gave him in 117. Barry agrees to let Nora delay her return home for a while. Joe has been napping in the STAR Labs lounge nobody else knew about for the last four years. Nora moves into the lounge. Wally tells Joe about how he met Elvis Presley in L314. Wally goes off to find himself again. Barry does not tell Iris what he learned about his disappearance in 2014. Ralph researches the death of Caitlin's father. He determines his death certificate was a fake. Iris' favorite ice cream is mint chocolate chip. Gridlock is killed by Cicada. Barry will eventually battle a villain named Mob Rule. King Shark will one day fight Gorilla Grodd. An interesting start to the season, despite a forgettable villain and the plot being focused around all the usual time-travel paradox nonsense this show revels in. Thankfully, the tone is kept largely light thanks to Jessica Parker Kennedy, who all but steals the show as XS. Can we get a Legion spin-off starring her? Or send Iris to the future with her for a few years, like in the comics?